Last Sunday Bev and I took Dot, our 19 year old daughter, and her best friend Bekah , out to enjoy an afternoon’s drive through the countryside at autumn’s peak. It was a classic fall day, a brisk wind pushing gunmetal clouds across a blue sky. The sunlight had that watery feel to it, softening the bright colors of the leaves. Later in the afternoon we ended up in an old town that is famous for being at the center of a Civil War battle. Dot mentioned that the town was considered a favorite haunt for many ghosts, apparently due to the thousands of violent deaths inflicted in that battle. Since the weather was so nice and the trees so beautiful we were surprised that only a smattering of restaurants in town were open. Of those few, we chose a busy place on the square. Most of the buildings in town looked quite old yet well maintained, and this one was no exception. There was a 20 minute wait for a table so I took my pager outside and sat on a bench. My wife darted into an antique store to check out their advertised “dental artifacts” while the girls ran to the lady’s room, upstairs in the restaurant. Ten minutes later the girls burst out through the front door, laughing and giggling. When I asked them what was so funny, Dot held out her phone to me. “Listen” she said. The traffic noise was loud on the square but I could just make out Dot’s voice saying; “Is there anyone with us today? If you’re here we would like to talk to you.” There was a long pause full of static, then Dot saying; “You can talk to me (garbled)?” Pause. “ You don’t have to be afraid of us. You can talk to me. My name is Dot. Pause. Allright, bye- bye.” This was followed by the sounds of both girls giggling. .
Back on the town square, I smiled and handed the phone back. One should never underestimate what Dot might do. Just then, as Bev was walking up, the restaurant pager went off. We went inside, had an enjoyable meal and within a couple of hours we were back home. That night, in the quiet of our living room, Dot listened to the recording again. Excited, she had us listen to it as well. In 2001 this restaurant burned down to the ground and it had since been rebuilt to the original specifications. During the reconstruction the body of a recently murdered woman had been discovered at the building site, where she reportedly had been left to die. (I have yet to find any other information). The restaurant staff says that the spirit of this woman haunts the building, open and closing doors and windows , with most of the activity taking place in the kitchen and in the ladies room. OK. I can’t explain this. Is this the result of some elaborate hoax being perpetrated by the operators of this restaurant? It’s not as if they promoted any haunting – it was not easy finding the story of the dead woman’s body. Could it be the tortured soul of someone named Kitty, somehow trapped in this house? Or, as my daughter suspects, was the spirit mocking Dot, comparing her to someone who casually calls for a pet, not knowing what they are really dealing with? Is Kitty someone we should be praying for? At one time I would never seriously consider such a thing as supernatural phenomena, but for over the past 5 years I have been concerned with things of a spiritual nature. As some will say, who knows? This entry was posted on October 24, 2007, 3:59 pm and is filed under Afterlife, Ghosts, God, Heaven and Hell, Metaphysics, Nature, Spirituality, Supernatural, Theology. You can follow any responses to this entry through RSS 2.0. You can leave a response, or trackback from your own site. 2b. Yes, absolutely true, but that argument can be applied to anything, narrative, didactic or otherwise, in the bible. 3. haha! Busted! good one. seriously, amb, sorry for being such a snot. I am reminded of the quote from you know where – SEEK, and ye shall find. Whatever we go looking for, if we look hard enough – we’ll find it ( once it’s in here – it’s out there). Or should that be the other way around – that’s the real question! I have no encounters to report myself, but I have been a guest in what I believe to be a haunted house in Leesburg, VA. The house is pre-civil war. When I walked into it, I noticed how cold it was. The owner said that the house maintained a cold temperature year round. No amount of heat would warm it in the winter and they never ran the AC in Summer. I was a guest in July and I would have been more comfortable with a sweater. These are the accounts of the family that lives there. -It is haunted by a woman whom they have seen. A woman lost the house to forclosure after her husband was killed in the Civil War. -A child was the first to see her. She appeared at the foot of her bed and was just watching the child sleep. -The owner collects printed stories and photographs from the Civil War era. One day, the owner brought a number of framed newspaper articles and photographs home. She piled them on a table and went to bed. The next morning, they were spread around the room. -There is a hanging lamp in the foyer. It swings for no reason. -Sometimes they can see their own breath in the house, even while sitting next to the fireplace. -Neighbors have gone in and seen the woman. She usually hangs out at the top of the stairs. I’ve been in this house. It’s scary! I’m also fairly certain that I’ve been visited by my mother. My mom died a little over 2 years ago. Nothing in my life has ever hit me as hard as her death. Not long after, I had a “visitation” or it might have been a dream. My dream… I was lying in my bed, asleep. I’m in the bedroom that I sleep in now. Nothing was different, everything is the same. In my “dream” I slowly wake up. My mother is next to my bed. I sit up. There is no doubt that it’s my mom. There is a thin cloth like a sheet between us. I cannot touch her. I later believe this veil represents the “here but not here”. Close, but cannot be touched. The seperation of worlds. Her face draws very close to mine. 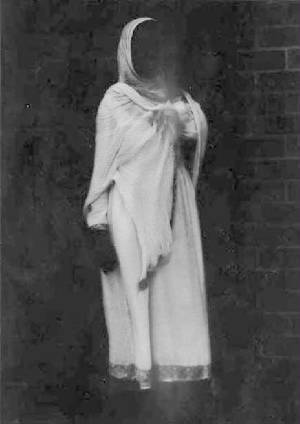 Every detail that I remember about her is visible except slightly cloudy because of the sheet -like veil. She looks at me. Every hair that she grew, every age spot that that she had was there. Without her even speaking, I feel her warm presence. Then she said, “I love you” and she was gone. In my dream I started to cry. When I awoke, the tears were still streaming down my face, just as they are now as I write this. Richard…I don’t know what to say to that. Thank you for sharing this with us. At least you have reassurance that the journey does not end on this side, What wonders must await us. Familiar spirits, wicked spirits, unclean spirits, demons, Satan, fallen angels, spirit of infirmity, principalities, powers, rulers of darkness, spirit of disobedience, thrones, dominions, Lucifer, spirit of divination (works with false prophets) and the Prince of the power of the air. These are some of the names of the non-physical beings of a kingdom that is in rebellion against God. All your stories about spirits will fit into one of these levels of evil spirits. I thoroughly believe that human spirits don’t get caught in walls or spaces or old battle fields. Jesus was pretty clear about the immediate destination in the after life. So was the book of Acts and the Apostle Paul. Jesus didn’t tell us to play with these things. It amazes me how foolish Christians can be in thinking they can be some kinda ghost-buster and use electronic equipment to “make contact.” We not supposed to contact these things…Jesus said “In my name they shall cast out demons…” That is warfare, not spooky goosebump play. Paul said “We wrestle not against flesh and blood, but against Principalities, powers, the rulers of the darkness of this age…etc.” Don’t play with your enemy, you will rue the day when the thing attaches to you and you don’t find deliverance. Well, that’s one way of looking at it. once my little cousin took a picture on Christmas eve. he was sitting on top of a big Christmas present and when we saw a little girl out in the picture. we didn’t erase it. but when we went to took out the pictures we were surprised. Hey, is that you Jeff? Can you tell us more about that? Did you see a ghost?